This map is a 3D representation of Turtle Island, documenting historical and current accounts of fossil fuel-related conflicts affecting Indigenous communities. The flipside of this 3-D map shows renewable energy transitions on Indigenous lands. This double-sided map asks readers what version of Turtle Island they want to live on. The finalized map will be posted for dissemination online and in the Mapping Back atlas, to be used as an educational toolkit. 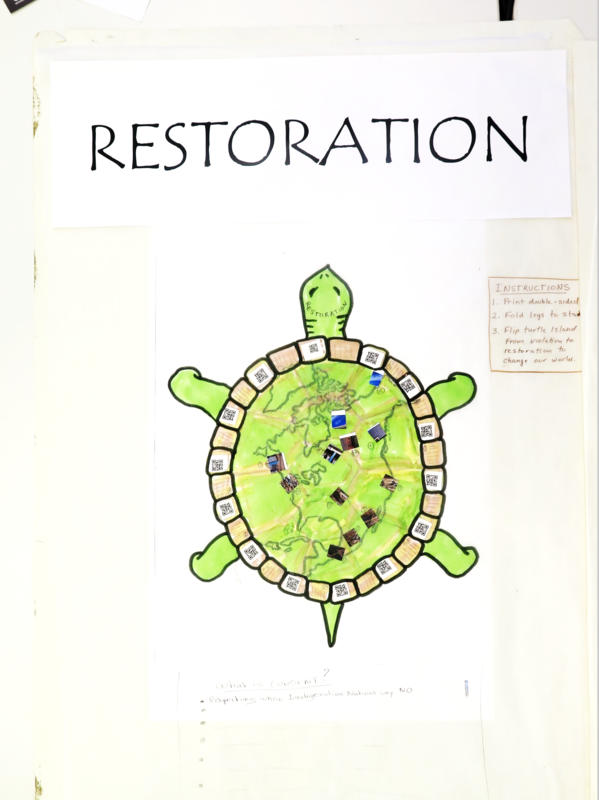 During the 2017 Mapping Back conference, our group collaborated to create a physical map of Turtle Island, documenting historical and current accounts of fossil fuel-related conflicts affecting Indigenous communities, as well as renewable energy transitions on Indigenous lands. 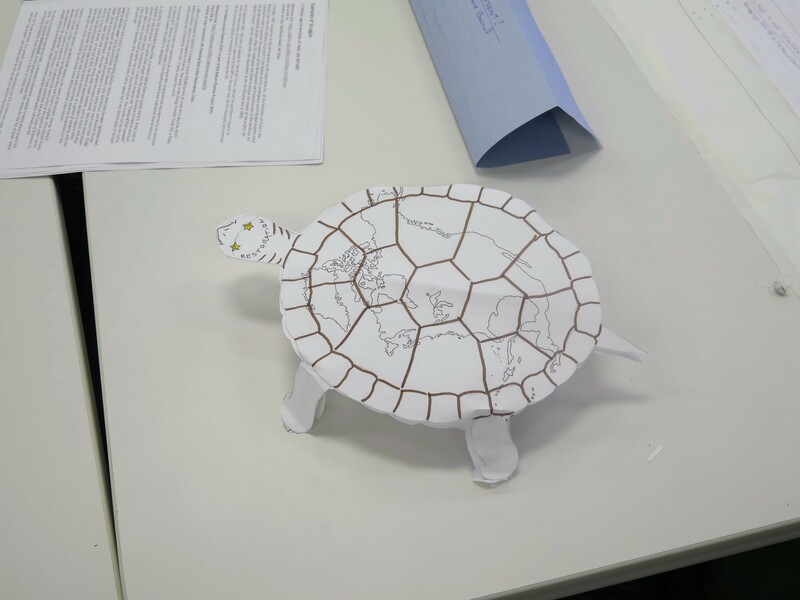 This map is designed to be converted from a flat document to a 3D turtle shape, which will serve as an engaging representation of indigenous understandings of North America as Turtle Island (map readers who print the document will be able to cut out the turtle shape and fold into a 3D shape). As demonstrated at the workshop, the map will also be double-sided, or reversible—one side will show conflicts between Indigenous communities and fossil fuel-related industries, and the other will display stories of Indigenous organizations and nations taking on leadership in climate justice and renewable energy initiatives. This double-sided Turtle Island will encourage map readers to engage with the question, what version of Turtle Island do I want to live on—one characterized by conflict and violation, or one defined by restoration of Indigenous sovereignty and environmental sustainability? 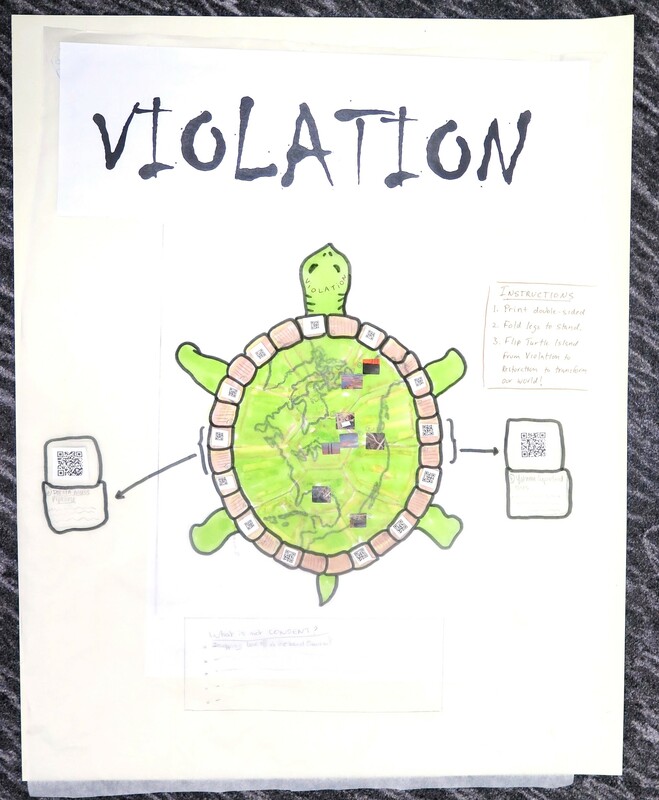 Each story on either side of the map will be accompanied with a QR code, which, when scanned by a phone, will link to a web page of an Indigenous organization that is engaged in addressing that particular project or issue. For example, in a story on the Dakota Access pipeline, there may be a link to the Indigenous Environmental Network, or in a story on Alberta First Nations transitioning to renewable energies, we may link to a page on the Alberta Indigenous Solar Program (which provides funding and technical assistance to Indigenous organizations and First Nations in the province who wish to upgrade to solar energy). The ideas behind these codes are (1) for the map to be as engaging and interactive as possible (2) to empower map readers to take action on these issues (3) to support Indigenous organizations and tribal nations in asserting their sovereignty and treaty rights to care for their homelands. For example, in cases of impact assessment for projects that occur on Indigenous territories the practice of merely depositing the required paperwork and documentation at a band office is viewed as an incident of violation. Whereas an example where developers took the time to meet with band officials, elders, and community members to understand what the community wants and needs are before the proposal of any project or development was viewed as consent. Within this frame, the map started to take shape as a teaching tool that could be used in schools and community events. The map itself is seen as a large, two-sided, table-sized map that takes the shape of a turtle. Cases of volition being documented on one side of the map and cases reflecting consent on the other. A case study guide to help facilitate discussions for each of the projects will accompany the map. The goal of the study guide is to help link the metaphors used to the physical spaces being explored.